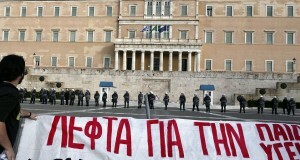 Socialist Party participated on all eight demonstrations. Below are reports from each demonstration and a sum up assessment. Over 4,000 participated in the ICTU protest in the Taoiseach’s (Irish Prime Minister) home county of Offaly on Friday. Public and private sector unions and workers were present including ASTI, TEEU, IMPACT, and SIPTU. The most notable private sector presence was from the striking workers of Green Isle Foods in Naas Co. Kildare. The enormous amount of negative media coverage had clearly further enraged the protesters. Comments made in the media about workers being “irresponsible” for downing tools of one afternoon were the focus of one speaker at the end of the demo who got huge cheers when listing some irresponsible actions of the government including the infamous NAMA legislation (54 billion bank guarantee and bail out). Despite not having a local base the Socialist Party made a good intervention. Socialist Party members circulated our leaflet from a stall in the town centre and then to protesters as they marched. A warm response was given and many people held our placards, 13 papers were sold. The need to build became clear as we were the only organisation presenting a socialist alternative to the government’s and the ICTU themselves proposals. Around 40,000 people marched through Dublin city centre on Friday showing their opposition to the governments’ strategy of attacking wages, services and jobs. Many workers expressed their bitter anger at how their incomes have deteriorated as a result of the attacks already imposed pay and conditions by the bosses and government. The two people at the head of the march were dressed up as a banker and a property developer. The Grim Reaper wearing a Brian Cowen mask also joined the march but apart from that the mood was more serious. A poll suggested 30% marchers were private sector workers and 70% public sector workers. 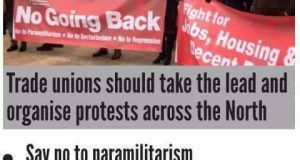 The Socialist Party had two large banners on the protest and our chants such as “NAMA, cutbacks – shame, shame, shame. Workers aren’t the ones to blame!”; “Government cutbacks no way, time to make the fat cats pays!”; “No ifs no buts, two million workers can defeat the cuts”, were taken up by people on the march. The Socialist Party handed out leaflets and sold our paper and journal and raised the demand for a 24h general strike as a next step to fight the government’s attacks and to step up the campaign against the cuts. Our arguments got a very good response. Many people came around our stalls, particularly when Joe Higgins MEP spoke through the megaphone. Despite the down pour, we spoke to a lot of people and our comrades sold 200 papers and 20 journals and a number of people expressed an interest in joining the Socialist Party. Around 6,000 people marched through Galway, holding placards that read: “Stop fleecing working families”, “Save jobs and services” and “No to NAMA, no to cuts”. These are quite minimal demands, yet were met with hostility from government ministers, who claim that there’s no alternative to the cuts. 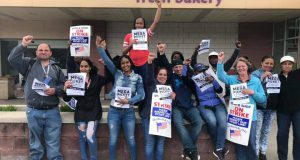 One of the main themes of the march was to oppose any attempt to divide between public and private sector workers, yet the march was dominated by the public sector unions. The mood of the march was angry, but somber. Only the Socialist Party led chants in an otherwise silent protest. Our posters, calling for a general strike, lined the march route. Overall, our intervention was the largest undertaken in Galway to date. We distributed 1,500 leaflets, sold 60 papers, raised our public profile and got a handful of people interested in finding out more about the Socialist Party. The National day of action saw 15,000 people march in Cork. The two Socialist Party branches in Cork met early setting up a stall near the meeting venue. In attendance were 14 party members, some supporters and a first outing for our new Cork City Socialist Party banner. First to sign our petition, calling for a 24 hour general strike ,were some council workers who had travelled up from Youghal. Having always paid 6.5% toward their pension, they were then lumbered with the pension levy. All this for a pension that is so poor it has to be augmented with the old age pension which of course they also have to pay for. Two comrades moved down the march with a pair of megaphones repeating the chant. Some sections remained passive, however others, most notably a large contingent of women impact members and another of CWU members, belted back the demand for a 24 Hour General Strike. The march was attended mainly by public sector workers. What was missing was the super exploited young workers employed in the private sector as well as the growing legions of the unemployed. The Socialist Party in Cork made an excellent intervention, we distributed 4,000 leaflets,sold 60 papers, collected €80 for our campaign fund and seven people expressed an interest in joining the Socialist Party. Around 6,000 workers braved gale-like conditions in Limerick to protest against the government’s attacks on the public sector. The storm had been threatening on the horizon all day and reflected the mood of many on the march. Those who the Socialist Party spoke to told of the hardship pay cuts and income levies have already caused and one person from a school in county Limerick revealed how they had lost three of their most senior teachers since the cutbacks, a third of the school’s staff. The Socialist Party held a meeting afterward on the government’s economic slash and burn agenda and how working people can defeat it, which some new people attended. All told the response to the Socialist Party before, during and after the march was good. We sold 37 papers and 3 journals and met three people interested in finding out more about the party. In Dundalk over 1500 people gathered to show their anger at the government’s disgusting attacks. Members of trade unions, OAPs and the unemployed joined together on the march in a show of solidarity. Jim Gaynor said “It’s an utter disgrace what the government are doing. I have to go back to work now as I’m handing out the dole and those people rely on that money but the government doesn’t care about them and they’re just left to rot”. The absence of young people was noticeable on the march however, Alan Walker, who works for an agency in a callcentre said “intimidation by management was widespread. They sent around a threatening email saying that if people walked out there would be consequences and nearly any application for annual leave was rejected”. There was general feeling of disillusionment. Primary school teacher, Jennifer Duffy, said “This is pointless; this hasn’t caused any disruption to the government or big companies. We should all be out on strike, teachers, civil servants, private sector workers, everyone. Otherwise this government will just walk all over us”. OAP Karl Quigley said “They robbed my Christmas bonus to pay to drive limos across the airport. Why are we paying for this? What about the Sean Quinns and the Larry Goodmans?” There was a real interest in getting our paper and we sold 60 copies of The Socialist, which was very good. The fact that 5,000 workers turned out for the protest in Sligo town, which has a population of 18,000, demonstrates the level of anger and defiance that exists among workers. All the main public sector unions were present, whose members expressed their disgust at the constant attacks from the media and government. An Irish Nurses Organisation Representative from Sligo General Hospital, where 70 beds have been lost since 2007, said, “It is very easy to take on the small man and the small woman while the big guys grow fat in their corporate boxes in Croke Park”. A representative from the retail and bar workers union, Mandate, condemned the “phoney war” being created by the media between private and public sector workers. There was plenty of recognition for Joe Higgins and the Socialist Party. We sold 29 papers and one person expressed an interest in getting involved with the paper. Everyone we spoke to were receptive to our ideas. Three old men were overheard arguing that revolution is the only solution, in contrast to the soft demands from the leaders of the Irish Congress of Trade Unions! The demonstration ended to the tune of Tracy Chapman’s ‘Talkin ‘bout a revolution’, while we made the arguments for a general strike on the 24th of November. Up to 9,000 people attended the ICTU march in Waterford. There was a decidedly working class character to the protest, with workers well-organised into contingents behind their union banners. Ambulance drivers, fire-fighters and postal workers from the South East region looked particularly impressive, marching together in their uniforms. The public sector was very well represented on the march but there were also smatterings of private sector workers, including a significant contingent of electricians as well as some workers from the retail, hotel and catering industries too. The march set off quietly, with the odd union official chanting on the megaphone “What do we want? – Fair Play. When do we want it – Now.” This weak slogan, indicative of the dreadful position of the ICTU leadership that the cuts should be spread over a longer period of time, didn’t really catch on. Workers took more to another slogan – “Cowen, Lenihan, Coughlan – Out, out, out!”. As the march slowly made its way along the Waterford quays, the ensuing bottleneck traffic let out a symphony of endless beeping in support. Workers from every industry, sector and union snapped up our leaflet, and the recognition of Joe Higgins and the Socialist Party was quite remarkable, in this city in which we’ve only recently developed a presence. We sold 35 papers and distributed over a thousand leaflets. Our local young members got an important taste of the support that remains for the trade union action in the South East region, despite the sell-out of union leaders via twenty years of social partnership. The turnout on 6 of November was significant and it reflected the real anger that exists about the attacks that the government are launching against working class people. That they have agreed to spend €54 billion for the impaired and bad loans of the banks while viciously attacking pay and public services, adds to the anger and exposes the gross inequality of Irish capitalism. While the turnout was significant it wasn’t overwhelming and could have been much bigger if the trade union leaders had given a real fighting lead and alternative. On the one hand the union leaders are saying they are opposed to the slash and burn Thatcherism of the government. On the other they say the €16 billion readjustment (cuts), should be carried out over eight years instead of four! They are organising protests and have said there will be a public sector strike on 24 November. The idea behind these actions however is not to defeat the government plans but to force the government to the negotiating table so a united and fairer approach can be adopted to getting out of the crisis. But any deal would be a frontal attack on workers living standards and would further devastate the economy. In advance of the day of action union leaders accepted that there would have to be serious cuts in public services. In reality they reduced their opposition to saying there should be no more cuts in public sector pay. They say this simply because there is huge anger among public sector workers who have already taken a huge pay cut this year and are being scapegoated for the crisis. The union leaders didn’t come out and say the government must and can be defeated. As well as accepting serious cuts in public services, they have said and done nothing on job losses and unemployment. Only speaking about public sector pay explains why there was little involvement of private sector workers on Friday’s marches. The weakness of the union leaders is giving the government and bosses the opportunity to try to divide public and private sector workers. The one day strike action on 24 November is now very important. A crucial issue is can a real struggle develop on the basis of the anger of public sector workers overcoming the position and conservatism of the right wing trade union leaders who don’t want to fight. As we did at all eight rallies on Friday, the Socialist Party is calling for the 24 of November to be turned into a general strike for all workers in opposition to cuts in pay, services and job losses in both public and private sectors. We are also arguing for the building of a new mass party to represent working class people to pose a real alternative and struggle for a genuine left and socialist government. The party sold just under 500 papers and met twenty five people who were interested in the Socialist Party.